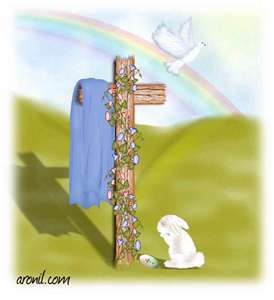 Easter is the central feast in the Christian liturgical year. According to the Canonical gospels, Jesus rose from the dead on the third day after his crucifixion. His resurrection is celebrated on Easter Day or Easter Sunday (also Resurrection Day or Resurrection Sunday). The chronology of his death and resurrection is variously interpreted to be between AD 26 and 36, traditionally 33. Easter marks the end of Lent, a forty-day period of fasting, prayer, and penance. The last week of the Lent is called Holy Week, and it contains Good Friday, commemorating the crucifixion and death of Jesus. Easter is followed by a fifty-day period called Eastertide or the Easter Season, ending with Pentecost Sunday.